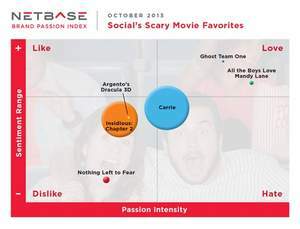 MOUNTAIN VIEW, CA--(Marketwired - Oct 9, 2013) - NetBase, the Social Intelligence Company, today announced the latest Brand Passion Index (BPI) which analyzed six scary movies to be released this Halloween. Powered by the Insight Composer, the Index revealed the behaviors, emotions, and opinions expressed across web and social media channels about "Carrie," "Insidious: Chapter 2," "All the Boys Love Mandy Lane," "Argento's Dracula 3D," "Ghost Team One" and "Nothing Left to Fear." In the social media movie analysis, NetBase found that the remake of "Carrie" generated the most buzz among the 2013 Halloween horror releases, with over 600,000 mentions over the past three months. "Insidious: Chapter 2" received the second highest buzz and "All the Boys Love Mandy Lane," finally available in the U.S., was the most loved. "Carrie," the remake of the 1970s classic, generated 58 percent of the overall chatter. It had a neutral Passion Intensity score of 55 and a low Net Sentiment score of 37. Online comments were mixed from those excited to see the film to those who complained the movie did not need to be remade. "Insidious: Chapter 2" had the second highest buzz, but ranked lower in Passion Intensity (30) illustrating the lack of excitement expressed by consumers about the sequel, saying they were let down by its lack of scariness. The studio may be building online conversations, but is not delivering on the scares. The movie with the highest Passion Intensity (a perfect 100) and the second highest Net Sentiment (67) was "All the Boys Love Mandy Lane." While the movie originally debuted at the 2006 Toronto International Film Festival, it is only now getting a limited release in the U.S. Online consumers are very excited about the film and express a high interest in watching it when discussing the movie online. Using NetBase Insight Composer, production companies, film distributors and advertisers can get a better understanding of movie audience's emotional and behavioral patterns to target them more effectively. By analyzing online conversations, they can uncover what scenes, plotlines and characters resonated most with viewers and explain viewership fluctuations in real-time. Read what consumers are saying about "Carrie." I kinda want to go see Carrie, thanks to the previews. Read what consumers are saying about "Insidious: Chapter 2." I still wanna see Insidious 2. Carrie looks scarier though. Read what consumers are saying about "All the Boys Love Mandy Lane." I'm excited to see #AllTheBoysLoveMandyLane. Each month, the Brand Passion Index (BPI) analyzes consumer passion for brands in various categories and publishes the results on the NetBase blog. Register for our next Demo Day about social's favorite comfort food. NetBase delivers the social intelligence that global brands and agencies use to publish, monitor, analyze and engage with customers in real time. Using a high-precision natural language processing (NLP) engine our platform processes billions of social media posts to extract structured insights delivered via customizable dashboards. Our solutions enable digital marketing, public relations, brand management, customer service, sales, and product innovation leaders to craft winning strategies faster. Clients include Coca-Cola, Kraft, HP, ESPN, GfK, McCann Erickson and Taco Bell. NetBase solutions are sold globally by SAP AG and J.D. Power & Associates. For more information, visit www.netbase.com, @NetBase, on Facebook page, LinkedIn, or YouTube. In the graphic above, the amount of chatter about a brand is indicated by the size of the bubble, while the placement of the bubble shows the sentiment and the intensity of passion.